*New* *Upgraded* Protector 22mm Titan *Short-Link* absolutely huge uncroppable hardened steel security chain (select length below), plus Squire Stronghold SS80CS ultra heavy duty padlock. The biggest and beefiest production security chain in the world, as far as we know, plus the world's strongest production padlock with the NW4 high tech extreme cylinder. This pairing has a superbly close fit between the lock and the chain - Minimum clearance for any type of attack, even including angle grinders! Note that this is a short-link chain so its links can't be interlocked in the same way as our other Protector chains. This version of the Titan Short-Link chain has a single Elongated End Link to suit the Squire SS80CS lock. It can only be locked end-to-end by means of the special Elongated End Link. That end link could itself have been a weak point, because it is effectively a long-link, so we have made it out of 24mm diameter bar! Sold Secure Motorcycle Diamond for the chain, and Motorcycle Gold for the lock. See alternative listings for the R1 cylinder variant, or for the RoundLock version. The short-link chain is 12kg/metre. Please note: The SS80CS is an ultra heavy duty lock that weighs 2.2kg for the lock on its own! Neither the lock, nor the 22mm chain, are recommended except for extreme situations where the absolute ultimate deterrent is required. Please note the lock deliberately only fits a single link of the chain. Keyed-alike not available with the NW4 cylinder. *New* *Upgraded* Protector 22mm Titan *Short-Link* absolutely huge uncroppable hardened steel security chain (select length below), plus Squire Stronghold SS80CS ultra heavy duty padlock. The biggest and beefiest production security chain in the world, as far as we know, plus the world's strongest production padlock. This pairing has a superbly close fit between the lock and the chain - Minimum clearance for any type of attack, even including angle grinders! The lock is usually supplied with the R1 restricted key profile (except when matching a previously-supplied alternative profile lock via the Keyed-Alike option). See alternative listing for the NW4 high tech extreme security cylinder variant, or for the RoundLock version. Protector 19mm ultimate uncroppable hardened boron steel chain (select length below), plus *new* Squire Stronghold SS80CS ultra heavy duty padlock with NW4 high tech extreme security cylinder. This is indeed the world's strongest production padlock. All Sold Secure Motorcycle Gold or higher. See alternative listing for the R1 restricted profile cylinder variant. The chain is 6.3kg/metre, supplied with either blue or bronze colour sleeving. Please note: The SS80CS-NW4 is an ultra high security lock that weighs 2.2kg! Not recommended except for extreme situations where the ultimate deterrent is required. *New* *Upgraded* Protector 22mm Titan *Short-Link* absolutely huge uncroppable hardened steel security chain (select length below), plus our super-compact and very tough RL21 RoundLock. The biggest and beefiest production security chain in the world, as far as we know, at an incredible price thanks to our RoundLock! This version of the chain has specially-machined end plates that largely enclose the RoundLock, all to increase the protection against angle grinders! Note that this is a short-link chain so its links can't be interlocked in the same way as our other Protector chains. This version of the Titan Short-Link chain has special end plates that suit our RoundLock, only. It is not possible to lock this chain with a conventional SS80CS/PL362 padlock. See alternative listings for the Squire SS80CS-NW4 high tech extreme security cylinder, or for the SS80CS-R1 variant. Please note this version of the 22mm Short-Link Titan chain can only be locked end-to-end with a RoundLock. Mutliple chains can be linked, end-to-end, with multiple RoundLocks (it is recommended that you get the chains the right way round in this scenario so you lock a large-plate end to a small-plate end to maintain full attack resistance). Protector 19mm ultimate uncroppable hardened boron steel chain (select length below), plus *new* Squire Stronghold SS80CS ultra heavy duty padlock. This is indeed the world's strongest production padlock. All Sold Secure Motorcycle Gold or higher. The lock is usually supplied with the R1 restricted key profile (except when matching a previously-supplied alternative profile lock via the Keyed-Alike option). See alternative listing for the NW4 high tech extreme security cylinder variant. Please note: The SS80CS-R1 is an ultra heavy duty lock that weighs 2.2kg for the lock on its own! Not recommended except for extreme situations where the ultimate deterrent is required. As used by the Ministry of Defence! Protector 19mm ultimate uncroppable hardened boron steel chain (select length below), plus Squire Stronghold SS65CS-XLN padlock (manufactured specifically to fit the 19mm chain). All Sold Secure Motorcycle Gold or higher. The lock is usually supplied with the higher-security R1 restricted key profile (except when matching a previously-supplied alternative profile lock via the Keyed-Alike option or when upgraded to the ultra-security NW4 cylinder). The chain is 6.3kg/metre; the padlock is another 1kg. The chain is supplied with either blue or bronze colour sleeving. NEW: Protector 19mm ultimate uncroppable hardened boron steel chain (select length below), plus the super-compact RoundLock with both RL21 and RL21A sockets (compatible with 16mm and 19mm chains, respectively). The chain is Sold Secure Motorcycle Gold (in fact, it is Sold Secure Gold in every category) and the RoundLock is Sold Secure Motorcycle Gold/Quad & ATV Gold/Bicycle Gold/Motor Scooter Gold approved. The chain is 6.3kg/metre; the RoundLock combo is another 0.8kg. The chain is supplied with either blue or bronze colour sleeving. 3 keys supplied. Keyed-alike available at initial order only (not available retrospectively). This package includes the standard RoundLock RL21 socket and also the RL21A socket, allowing a beautifully close fit with 16mm and 19mm chains, respectively. The RL21A socket is custom-made to suit the Protector 19mm chain. The RoundLock can also be used as a motorcycle disc lock - Check that you have a suitable opening that will take the 21mm diameter shackle in your brake disc or disc carrier. You can then use this with a chain when at home and as a disc lock when out and about. Note that disc locks do not prevent a bike from being lifted into the back of a van, which is a common technique employed by thieves. Protector 16mm uncroppable hardened boron steel chain (select length below), plus Squire Stronghold SS65CS padlock. All Sold Secure Motorcycle Gold or higher. The lock is usually supplied with the higher-security R1 restricted key profile (except when matching a previously-supplied alternative profile lock via the Keyed-Alike option or when upgraded to the ultra-security NW4 cylinder). The chain is 4.5kg/metre; the padlock is another 1kg. The chain is supplied with either blue or bronze colour sleeving. Shed Shackle, Protector 13mm long link medium-weight chain (select length below) with Squire Stronghold SS50CS High security CEN 4 padlock (usually supplied with the higher-security R1 restricted key profile, except when matching a previously-supplied standard-profile lock via the Keyed-Alike option or when upgraded to the ultra-security NW4 cylinder). Sold Secure Bicycle Gold/Motor Scooter Silver on the chain and Motorcycle Gold on the lock. Recommended for high value bicycles and low value motorbikes/scooters. The chain is 2.9kg/m, the padlock is another 0.6kg, and the Shed Shackle another 3kg. NEW: Protector 16mm uncroppable hardened boron steel chain (select length below), plus our motorcycle-grade DIB-Series D-Lock (select size below). The chain is Sold Secure Motorcycle Gold (in fact, it is Sold Secure Gold in every category) and the DIB D-Lock is Sold Secure Motorcycle Gold/Quad & ATV Gold/Bicycle Gold/Motor Scooter Gold approved. The chain is 4.5kg/metre; the DIB D-Lock is another 1.5kg (for the 130mm size), or 1.7kg (for the 190mm one). The chain is supplied with either blue or bronze colour sleeving. Shed Shackle, Protector 11mm medium-weight chain (select length below) with Squire Stronghold SS50CS High security CEN 4 padlock (usually supplied with the higher-security R1 restricted key profile, except when matching a previously-supplied standard-profile lock via the Keyed-Alike option or when upgraded to the ultra-security NW4 cylinder). Sold Secure Bicycle Gold/Motor Scooter Silver on the chain and Motorcycle Gold on the lock. Less secure than the heavier chains, but more practical to thread through bicycles etc. Recommended for high value bicycles and low value scooters. 7.5kg total. NEW: Protector 16mm uncroppable hardened boron steel chain (select length below), plus the super-compact RL21 RoundLock. The chain is Sold Secure Motorcycle Gold (in fact, it is Sold Secure Gold in every category) and the RoundLock is Sold Secure Motorcycle Gold/Quad & ATV Gold/Bicycle Gold/Motor Scooter Gold approved. The chain is 4.5kg/metre; the RoundLock padlock is another 0.6kg. The chain is supplied with either blue or bronze colour sleeving. The RoundLock is not suitable for our 19mm chain unless the optional extra RL21A socket is also purchased and that is used in place of the standard RL21 socket. Shed Shackle, Protector 11mm medium-weight chain (select length below), Squire Stronghold SS50P5 Open Shackle padlock. Sold Secure Bicycle Gold/Motor Scooter Silver on the chain and lock. Less secure than the heavier chains and closed shackle locks, but more practical to thread through bicycles etc. Recommended for medium value bicycles and similar. 7.3kg total. *NEW* HS1 Heavy Duty CEN 4 Hasp & Staple with Squire Stronghold SS50CS High security CEN 4 padlock at a bargain price! The RRP for the lock is £72.10 and the RRP for the HS1 hasp is £48.00, totalling £120 - Get both in this Package Deal for much less! (The SS50CS lock is usually supplied with the higher-security R1 restricted key profile, except when matching a previously-supplied standard-profile lock via the Keyed-Alike option or when upgraded to the ultra-security NW4 cylinder). Very tough: Sold Secure Padbars Silver and CEN 4 approved hasp, and Motorcycle Gold and CEN 4 approval on the lock, and also Police Secured-by-Design approved on both. 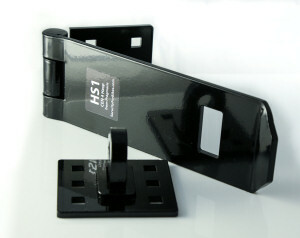 Ideal for securing a shed door or wooden double doors. Ideal for Safer Homes compliant housing projects, requiring Police Secured-by-Design approval. Select bolt length and lock keying options required and the price will adjust automatically.